If that weren’t enough, the Sixers pulled off a blockbuster by moving injured and struggling former No. 1 overall pick Markelle Fultz to the Orlando Magic for another solid bench option in Jonathon Simmons as well as a first and second-round pick. That’s quality value for a player that didn’t have a future in Philadelphia. Like clockwork, the Bulls pulled off one of their best trades in recent franchise history by sending Parker and Portis to the Washington Wizards for a high-upside forward in Otto Porter Jr. We can go ahead and say that Porter is overpaid. He is. He also has not lived up to the four-year, $106.5 million deal he signed with Washington back in 2017. That’s fine and dandy. Porter is still only 25 years old. He boasts a career 40 percent three-point mark and is a solid perimeter defender. Chicago turned to short-term pieces into a potential building block. Not bad. The Mavs were also able to rid themselves of Harrison Barnes contract without giving up a draft pick to the Sacramento Kings. In fact, they added a high upside wing in Justin Jackson in that deal. Yeah, we’ll go ahead and call Mark Cuban and Co. winners here. 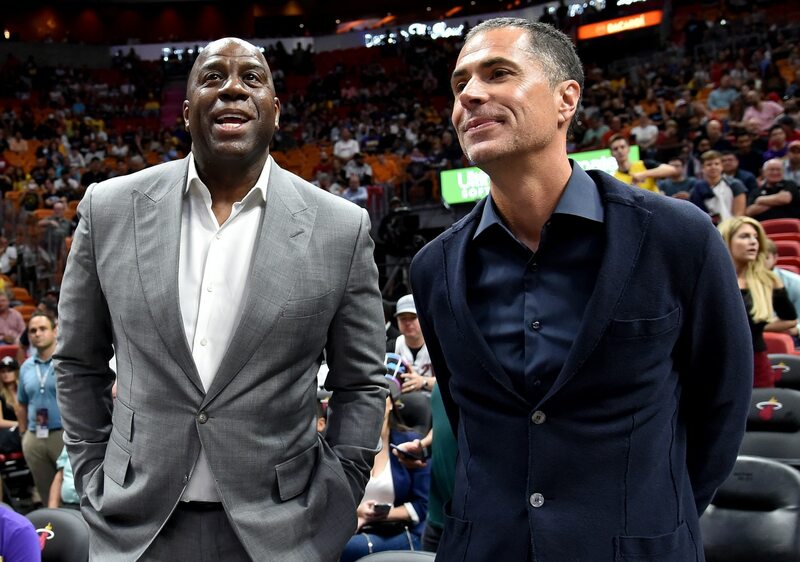 With all the hoopla surrounding the Lakers the past couple weeks, they came out of the NBA trade deadline having added Reggie Bullock and Mike Muscala? Heck, the Lakers even traded their best big man in Ivica Zubac to get Muscala. That’s not going to make LeBron James happy as Los Angeles finishes up what promises to be a ho-hum 2018-19 campaign. And in reality, we can blame team president Magic Johnson for this mess. He was played like a fiddle by Pelicans general manager Dell Demps in Anthony Davis trade talks. It’s as simple as that. We can say that Demps got the best of Magic Johnson in Anthony Davis trade talks. We can also say that the Pelicans were dumb not to accept the Lakers’ final offer. Both can be true. Said offer reportedly included Lonzo Ball, Kyle Kuzma, Brandon Ingram, Josh Hart, Ivica Zubac, Kentavious Caldwell-Pope and two first-round draft picks. That’s The Godfather of all offers — one that unlikely to be matched during the summer. In the meantime, New Orleans has the Anthony Davis drama hanging over its head as the organization finishes up yet another lost season. Demps also made the questionable decision to trade star forward Nikola Mirotic to the Milwaukee Bucks for four second-round picks and two cap fillers— a mere calendar year after exhausting New Orlenas’ 2018 first-round pick to acquire Mirotic from Chicago in the first place. Ouch! Is Iman Shumpert a nice piece off the bench? Sure. Is yielding a lottery-protected first-round pick in what is a loaded 2019 NBA Draft for Shumpert a good deal? Given that Houston will more than likely make the playoffs, the answer to that question is a resounding no. It doesn’t do a whole lot to move the needle in an Western Conference that’s still controlled by the two-time defending champion Warriors and an upstart Denver Nuggets team.